Attached is the photograph I promised yesterday. It was taken some years back and the unfortunate sheep had been hale and hearty the previous day. You should be able to see the bruising on the throat but I'm not sure whether the neck was broken or not. 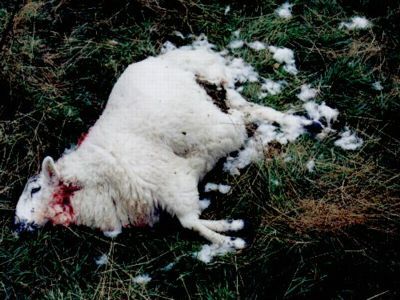 I have noticed with sheep kills, certainly here on the Black Isle, that where there is a sharp boundary (i.e a fence or wall) between woodland/scrub and the ground being grazed by sheep, they seem to be left alone by the resident cat even if there have been regular sightings in the immediate area. However, where the woodland or scrub overlaps the grazing ground creating a mosaic, the sheep here are more susceptible to predation. I know the reasons for this are obvious but this is useful information we can give to farmers who might be at risk of or have experienced losing stock. Sensible shepherding is preferable to a bullet after all. You are so right! The sheep like to tuck themselves into the gaps between fingers of scrub stretching out into the pasture, and that is where they get picked off. Clearing brambles etc at the edge of fields does help. 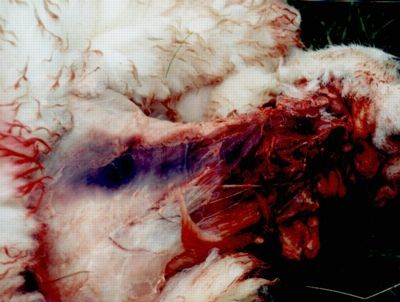 Some farmers here in Wales have reduced predation by doing this, where the lie of the land made it a feasible option.